The deadline is Monday, June 30, for the Army Corps of Engineers to receive your comments opposing a permit for Harris County to destroy nearly 1.5 miles of our wild Buffalo Bayou in and around Memorial Park, including the Hogg Bird Sanctuary. The fight for the life of our proud, southern bayou will continue, and we will prevail with your help. However, you must let the ACE as well as all our political representatives know that you oppose this bizarre, wasteful $6 million project. Here’s how to do that. In addition you can sign the MoveOn.org petition that will be sent to the proper authorities on Monday. Their project will do none of those things, and the plain proof is in their own permit application. 1. The first thing to know is that the bayou here is not in need of restoration. Buffalo Bayou as it flows between Memorial Park and the Hogg Bird Sanctuary on the north and the River Oaks Country Club on the south is some of our last natural bayou and riparian wilderness remaining to the people of Houston. This, our most beautiful reach of the bayou, long preserved as part of our public park, is in better condition than any altered stretch of the bayou, and to know why it’s important to understand what a riparian forest buffer is. A riparian forest already does everything that they claim to be the purpose of this boondoggle: it controls erosion and sedimentation, improves water quality, filters pollution, slows storm waters, etc. Every single academic and professional paper you can find emphasizes the importance of protecting riparian buffer. No true river scientist advocates bulldozing riparian buffer. The condition of most of the riparian buffer on the banks of our Memorial Park is rated as near-perfect, a score of 4.5 out of 5, according to the county’s own permit application. See page 450 in the permit application. A magnificent, very old high bluff in the Hogg Bird Sanctuary, and the lovely tributary it overlooks, have perfect riparian buffer. (Pages 533 and 557). Even much of the south bank owned by the country club has near perfect riparian buffer. The average score of our natural riparian forest in this area is significantly reduced by the eroding lawns of a few large, private homes on the north bank and the inclusion of edges of the manicured golf course on the south bank. The riparian forest of our public park is functioning as it should. Why should we sacrifice our beautiful, naturally functioning bayou because private homeowners stripped the riparian buffer on their property to create lawns? Why should we taxpayers pay millions to restore private property while destroying our own public property? Since our bayou forest is fine, in order to “restore” it, they first have to destroy it. They will do this by bringing heavy equipment into our park and cutting access roads to the bayou through the forest. (See Map 1.) They will use the bulldozers and backhoes to strip the trees and vegetation from eighty percent of the project area (not thirty percent as claimed by the Bayou Preservation Association), regardless of its condition and including in the scenic Hogg tributary. (See Map 2.) They will scrape up the riparian sand and soil in the banks, the ancient sandstone and red clay (our geologic history) and archeological remains, and cart it away somewhere. They will dig out and cut new channels in the bayou, lay down logs and other stuff, fill in parts of the bayou, which includes more than two dozen wetlands, deface and cover up the thousands-year-old high bluffs, bring the soil and sand back, grade the banks and create new slopes, cover the new banks with fiber mats and Bermuda grass, and plant some lilies and trees. Map 1: The dotted red lines show the 14.35 acres of riparian forest to be scraped and bulldozed. According to the HCFCD, 80 percent of the vegetation in the targeted area will be removed. Note the areas to be cleared of trees extends into the interior of Memorial Park towards the maintenance facility. This is for access by heavy equipment to the bayou. Also note the land and forest to be lost by the River Oaks Country Club on the south, and the destruction of a scenic tributary and a magnificent high bluff in the Hogg Bird Sanctuary on the north. Why Do They Need to Bulldoze the Forest In Order to Restore It? But doesn’t this also apply to their purported plans to re-vegetate the 80 percent of the project length that they plan to strip and recreate? Or do they plan to leave their newly “restored” banks essentially bare and shadeless? 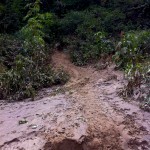 Erosion and Sedimentation Will Not Be Reduced, and Water Quality Will Not Be Improved. 4. The HCFCD permit application claims that this small natural riparian area contributes “approximately 359 tons per year of soil erosion.” (Page 447.) That sounds like a lot, but our analysts have put that into perspective. If you spread out that entire year’s worth of soil erosion on a football field between the twenty and forty yard lines, the sediment would be only nine inches high. The vast majority of the sediment comes from further upstream. (See page 446.) Buffalo Bayou is twenty-six miles long from the Addicks and Barker dams in Katy to the Sabine Street bridge downtown. This short but significant project area in and around our Memorial Park is our best natural, functioning bayou. It contributes only an infinitesimal amount of sediment to the waterway. There is no evidence anywhere in the application permit, no scientific studies, no explanation of how or why excavating and filling in and rechanneling the bayou reduces erosion better than the natural system already in place. Furthermore, removal of sediment from the water has no impact on the amount of bacteria in the water. This is according to the expert analysis of Dr. George Guillen, executive director of the Environmental Institute of Houston and an associate professor of biology and environmental science at UH-Clear Lake. But don’t listen to us. Read the HCFCD’s application permit. Page 452: Water quality will not be improved. Map 2: Areas of the natural banks of Buffalo Bayou to be excavated and filled. Yellow is excavate. Orange is fill. This Project to Destroy Our Beautiful Buffalo is Nothing Other than the Same Old Flood Control Project to Make Buffalo Bayou a Bigger Drainage Ditch. “The project purpose is … improvements to the dimension, pattern, and profile allowing the stream to convey storm water and sediment loads more efficiently.” Page 2 of the permit application. This stealth flood control project is a joint venture between Harris County, the City of Houston, and the River Oaks Country Club. Each entity is contributing $2 million to the $6 million cost of the “demonstration” project, and the Houston city council voted last June to approve and fund it. This zombie channelization plan, a “holistic” variant of proposals long opposed by the Bayou Preservation Association, was largely conceived by the board of the BPA, who must be in need of work, do-nothing preservation being too passive and non-remunerative to somebody, and is actively promoted by the BPA and the Memorial Park Conservancy despite the huge of loss of trees and wildlife habitat, and damage to the bayou and our great public park. Read the editorial in the Examiner. Harris County Flood Control District Director Mike Talbott Says He Could “Sleep Just Fine” If Project Doesn’t Go Ahead. Talbott is also quoted as saying the bayou is trying to change course by “eroding the land at the water’s edge” at the bottom of the cliffs while the tv shows what looks like a lot of sand deposited on the bank at the bottom of the cliff. That would be sand from upstream, where most of the sediment comes from (according to the HCFCD’s permit application to the Army Corps of Engineers). But watch for yourself and decide. And thanks, Ted Oberg, for paying attention. Thousands-year-old cliff taking way too long to erode away. County will bulldoze it instead. 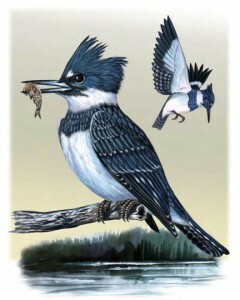 Belted Kingfisher. ©Houston Audubon Society. On Sunday (June 22) I canoed down Buffalo Bayou with a friend, from Voss to the junction with White Oak Bayou. Seeing this transect of the bayou (which included the section slated for “restoration”) has convinced me that this project is wrong, wrong, wrong on a number of levels: aesthetically, environmentally, and financially. I have heard from proponents of the plan that the erosion in this area is “significant” and that the vegetation is “largely invasive species.” Neither of these claims are true, as far as I could see. 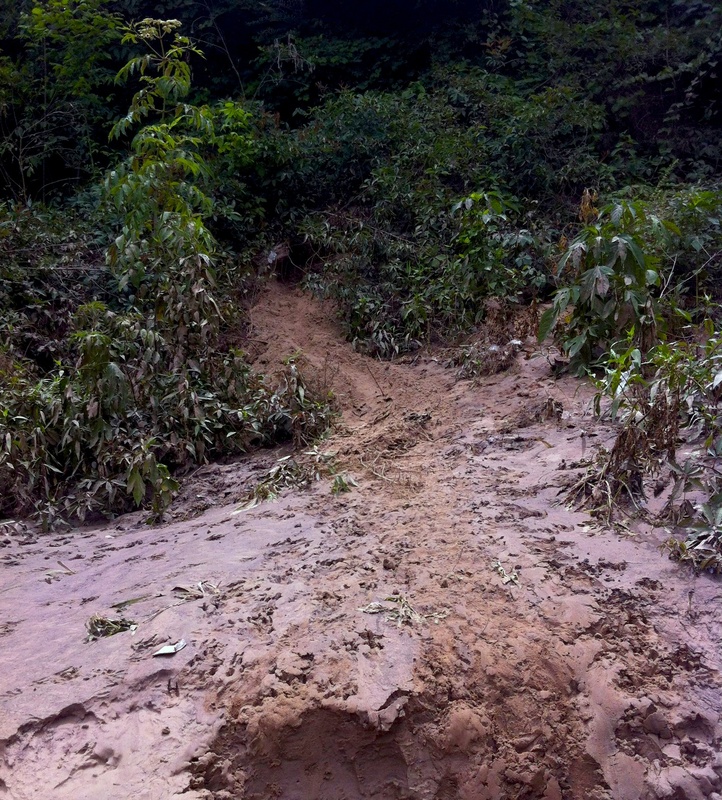 Yes, there are areas where some erosion is taking place – but this is natural on a waterway. Property owners all along the bayou have used a variety of different means (immensely less drastic and costly than what is proposed) to shore up their banks and reduce or eliminate erosion. Certainly there were a few non-native species along the banks, but the prevailing vegetation was native vines, sycamores, box elders, and other trees and shrubs native to the area. The cliffs, which would be eliminated in the proposed reconfiguration, are important habitat for nesting kingfishers (which we saw only in this stretch of the bayou). Furthermore, the stretch that borders Memorial Park is the only part of the bayou where natural habitat (and all the animals it contains) borders the watercourse. It was an awful shock to come out to the areas that have already been modified and “improved” = where no trees overhang the bayou, where graded, grassy slopes come down to the water’s edge, and where there is no semblance of “natural” anywhere. In these areas (from Montrose and farther east) it was hot, exposed, and little wildlife was evident. These “improved” areas were stark and ugly – a human-manipulated landscape with no shade and no wildlife. I can only imagine the expense of carrying out the proposed “improvements” – and at what environmental cost? Seems to me the River Oaks Country Club could use some of the methods already put in place by homeowners along the bayou’s banks to shore up the areas of concern – leaving the rest alone. Taxpayers should not have to pay for this drastic plan that would have catastrophic and permanent effects on the aesthetics and environmental integrity of Buffalo Bayou along this stretch. I thoroughly oppose the proposal and hope that you, Mayor Parker and city council members, will stand up to those trying to sell this as an improvement. It is not. Please say no to this proposed “restoration” of Buffalo Bayou. 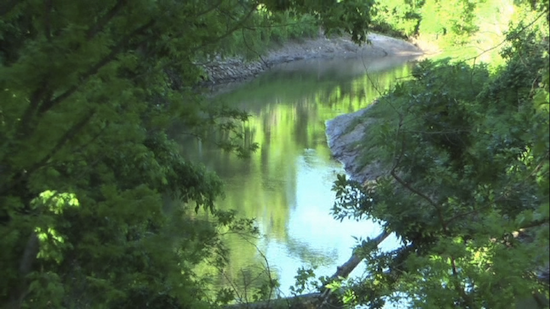 Short, lovely film of the wild Buffalo Bayou that the BPA wants to destroy. Watch a six-minute film of a trip through the wild, historic part of Buffalo Bayou that Harris County, the Bayou Preservation Association, and the Memorial Park Conservancy want to destroy. Difficult to believe, but true. About twenty people, including City Council member Oliver Pennington, were at the monthly meeting of Super Neighborhood 22 last Thursday to hear the Bayou Preservation Association argue in favor of its bizarre plan to destroy Buffalo Bayou. 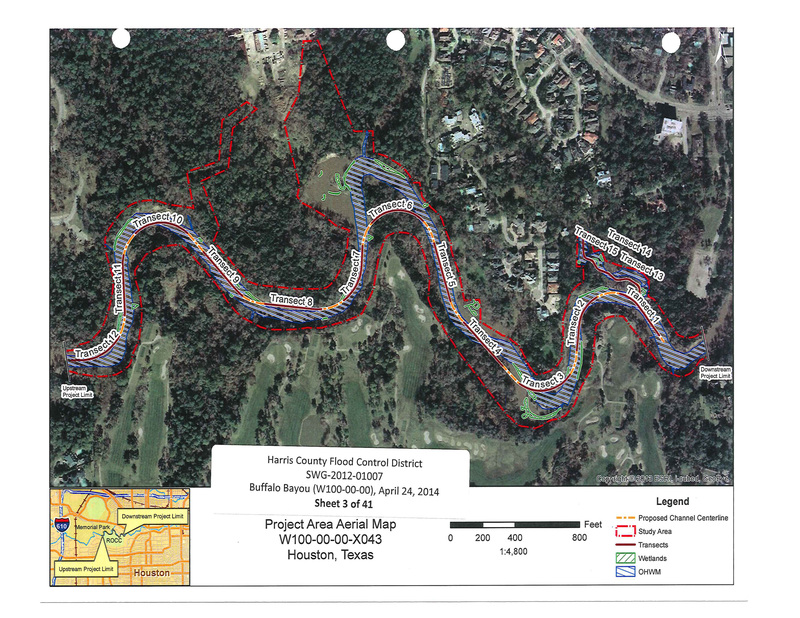 The BPA and the Memorial Park Conservancy are in cahoots with the Harris County Flood Control District to do what the county has long wanted to do: strip and channelize some of the last remaining natural segments of Buffalo Bayou. Yes, it is difficult to believe. The BPA was founded long ago to prevent this very thing from happening, and the MPC also took over the mission of Miss Ima Hogg and others to preserve and protect Memorial Park. The project they have helped create and eagerly promote would bulldoze the vegetation and trees from most of both banks along nearly 1.5 miles of the bayou as it flows past the Hogg Bird Sanctuary and Memorial Park on the north and the River Oaks Country Club golf course on the south. It would rechannel the bayou, grade the banks, plant them with Bermuda grass, destroy the scenic tributary of the Hogg Bird Sanctuary as well as the very, very old high bluff that overlooks it, and a lot more. But it will all be done in a “holistic” way, with regret and great sympathy and understanding for what the bayou really wants to be, and also it will be gluten-free, although alas, not animal-cruelty free, as most of the creatures, including fish, beaver and otter, dragonflies and hawks, will have to sacrifice their habitat. The Mayor supports “prioritizing natural infrastructure.” So tell her to drop the plan to bulldoze 14 acres of riparian forest in the middle of our city. Mayor Annise Parker was in the national news this weekend with a resolution “Prioritizing Natural Infrastructure” at the US Conference of Mayors in Dallas. Let the mayor know you support this wise resolution and urge her to honor it by withdrawing from Harris County’s unwise plan to bulldoze hundreds of trees, vegetation, and habitat from the wild banks of Buffalo Bayou in and around our public Memorial Park. 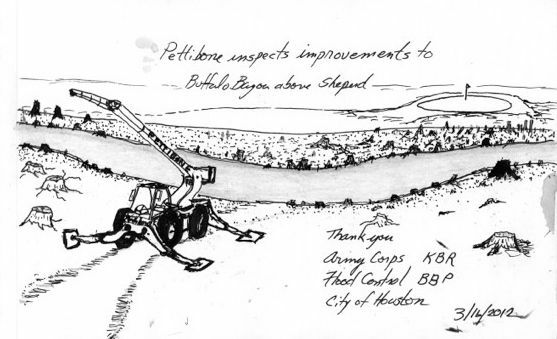 Pettibone inspects the “restoration” of the wild banks of Buffalo Bayou. Drawing by Kirk Farris. Perhaps the mayor doesn’t realize that the plan she and the city council voted to spend $2 million of taxpayer money on will strip the tree cover from some 14 acres in and around our great public park in the middle of the city. 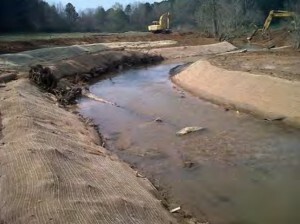 This tree cover is riparian forest, an extraordinarily rare treasure in the center of one of the nation’s largest cities, and its natural function is to absorb carbon dioxide from the air, filter pollutants from the water, protect the banks from erosion, trap sediment, slow storm waters, shade the bayou, and provide wildlife habitat. It’s not too late to stop this horrible project, called the Memorial Park Demonstration Project and dishonestly billed as a “restoration” project. The Army Corps of Engineers is currently considering Harris County’s application for a permit to start clearing the forest and the public has only until June 30 to make comments. But we can pressure our mayor and city council members and let them know that we have lost enough trees and nature in our city and in Memorial Park. We oppose this pointless project to destroy our Buffalo Bayou so that they can “restore” it. Potholes, pollution, no toilets in the park: so why is the City of Houston spending $2 million to destroy our wild Buffalo Bayou? What an experience at the open meeting of the Houston City Council today. We sat patiently and listened with interest for more than three hours to long-suffering Houstonians complaining about the City not finding the money to fix their horribly potholed streets, their polluted water systems, their backed-up sewer systems, their lack of toilets in their public parks, mental health care, libraries, and more. It was a privilege to listen to these engaged people, and it gave additional weight to our argument: why is the City of Houston wasting $2 million on a pointless project to destroy Buffalo Bayou in and around Memorial Park, a public natural treasure, an educational resource, a last remaining bit of wilderness in the middle of the city available to all, when there is so much need elsewhere? By the time we were called to give our testimony around 5:30 p.m. the chambers were almost empty and Mayor Annise Parker and many of the council members had left. Remaining to listen to us were Ed Gonzalez, Robert Gallegos, Mike Laster, David Robinson, Michael Kubosh, Brad Bradford, and Jack Christie. Ellen Cohen and Oliver Pennington, whose districts include Memorial Park and River Oaks on Buffalo Bayou, had already split, along with the mayor. But those who remained were attentive, thoughtful, and responsive. We thank them. And we will persevere. They will not get away with this. We are not going to let them destroy our wild Buffalo Bayou or its magnificent, forested banks high or low. We will continue to urge the City of Houston to withdraw from this ridiculous, pointless, expensive plan to destroy Buffalo Bayou in order to “restore” it. And you should too. Show the force! Contact your city council representatives and let them know that you oppose this stupid, destructive, expensive project. Project is a pointless waste of money and will cause irreversible loss of natural flood, erosion, and sediment control, wildlife habitat, and hundreds of trees in middle of city. Houston, TX, June 16, 2014—Opponents of a bizarre plan to destroy Buffalo Bayou in order to “restore” it will urge Mayor Annise Parker and members of city council to withdraw their support for the costly project. The project will raze hundreds of trees and all the vegetation from nearly 1.5 miles of some of the only natural bayou left in the center of Houston. Speakers will argue that the plan will destroy a unique natural treasure. Houston is one of the only large cities in the country with such a wilderness resource available to the public in its center. The City of Houston is spending $2 million for a project to scrape, excavate, and rechannel Buffalo Bayou as it flows through the Hogg Bird Sanctuary and past Memorial Park on the north and the River Oaks County Club golf course on the south. Harris County and the country club are each contributing $2 million also, although the club owns half of the project area. 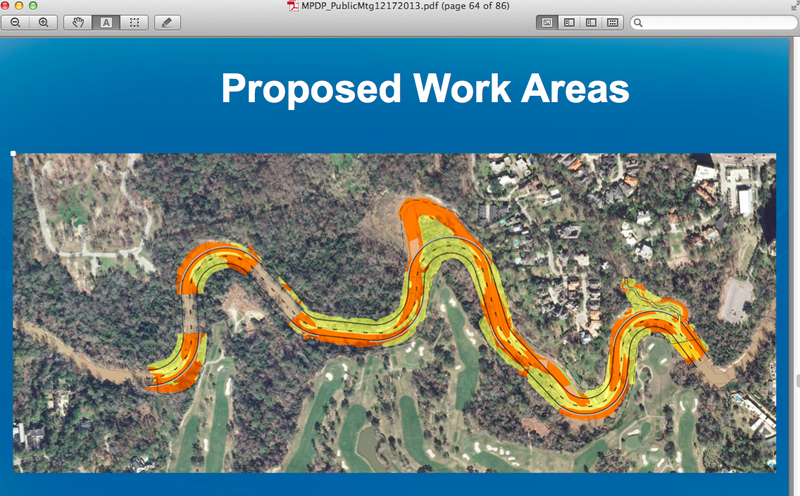 The dotted red lines show the 14.35 acres of riparian forest to be scraped and bulldozed. According to the HCFCD, 80 percent of the vegetation in the targeted area will be removed. Note the areas to be cleared of trees extends into the interior of Memorial Park towards the maintenance facility. This is for access by heavy equipment to the bayou. Also note the land and forest to be lost by the River Oaks Country Club on the south, and the destruction of a scenic tributary and a magnificent high bluff in the Hogg Bird Sanctuary on the north. Is there ecological benefit to Harris County’s plan to bulldoze the wild banks of Buffalo Bayou in and around Memorial Park? Will our beautiful southern bayou be improved? Common sense says no, but the Harris County Flood Control District says yes. What is the truth? The flood control district in its permit application (warning: big pdf file but see page 451) to the Army Corps of Engineers claims that there is “ecological lift” from their project to “restore” the bayou by stripping riparian forest and vegetation from both banks and parts of the Hogg Bird Sanctuary and digging up, filling in, and reconfiguring our 18,000-year-old bayou, one of the few natural reaches of the river remaining in the city. On Wednesday, June 18, the public is invited by the Houston Sierra Club to a presentation on the results of its investigation into these amazing claims by the Harris County Flood Control District. There will be a visual exhibit of the project area showing the value of Buffalo Bayou as a natural resource. The presentation will be at the United Way Community Resource Center, 50 Waugh Drive, Houston 77007. Refreshments will be served at 6:30 p.m. The program begins at 7 p.m. Does this look like ecological improvement to you?